PHILIPSBURG–O’Neal Arrindell, who was arrested August 21, 2018, on the order of the Prosecutor’s Office for intentionally removing the luxury yacht Jefe which had been seized by the Prosecutor’s Office on July 11, 2018, is facing a prison sentence of three months, it emerged during Thursday’s Court hearing. The businessman will learn his fate on April 11, when the Judge will give his decision in this case. The Anti-Corruption Taskforce took Arrindell (37) into custody for two days at the time. Arrindell, who is the owner of Checkmate Security with more than 400 employees, is a suspect in the Emerald investigation in which he and suspended Port St. Maarten Group of Companies Chief Executive Officer Mark Mingo are accused of defrauding the Port of a total of US $11 million over a number of years. 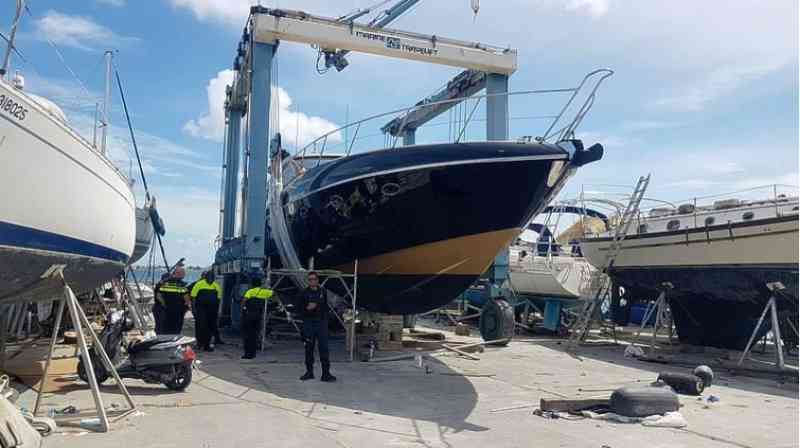 According to the Prosecutor’s Office in August last year, the vessel Jefe, which was among several seized properties, was in the scaffoldings at Bobby’s Marina in Simpson Bay at the time of seizure and was not allowed to be moved or launched into the water. However, the boat was no longer present during a Coast Guard inspection at Bobby’s Marina on July 22, 2018. Boat manager Yamiv Eliyahu, who was heard as a witness, told the Investigating Judge that the boat needed repairs but that he had received notification that the vessel had to be removed from Bobby’s Marina to make space for another boat. He said he had given the orders to the boat captain to move the boat to Anguilla and stated that no one had notified him that the boat was confiscated. Arrindell, who had remained silent during the investigations in his case, told the Judge on Thursday that he had not authorised anyone to move the boat, and that no one had informed him that the vessel had been confiscated. In considering the case proven, the Prosecutor’s Office stated that Coast Guard officials had instructed Arrindell that the boat was not to be removed from Bobby’s Marina. At first sight the incident may seem a “boyish prank,” but the Prosecutor said it constituted a serious crime because the removal of seized property undermines the legal order and the public authorities. The Prosecutor estimated the value of the boat by auction at between 300,000 and 350,000 euros, but attorney Brenda Brooks claimed the 70-foot Sunseeker motor yacht, which she said was actually named Penguin and not Jefe, had an actual value of more than US $1 million. According to Arrindell’s lawyer, her client should be acquitted for lack of evidence. She further claimed the case should be thrown out because her client was not the boat’s owner and properties belonging to a different person cannot be seized. She also stated that the Prosecutor’s Office had failed to use a bailiff to present her client with the proper documentation pertaining to the confiscation and that her client had not been aware that the boat was seized. The lawyer also claimed that the witnesses, among them several Coast Guard officials, had provided contradictory statements about what had actually transpired at Bobby’s Marina and about whether Arrindell had actually understood that the boat was not to be removed or be put in the water, as the Prosecutor’s Office claimed.